In this report, the structural, electronic, magnetic and thermoelectric properties of CoX′NbGa (X′ = Cr, Mn, Fe) quaternary Heusler alloys are investigated using the full potential linearized augmented plane wave method in combination with the semi-classical Boltzmann transport theory. The exchange and correlation effects are treated using generalized gradient approximation and modified Becke-Johnson scheme. 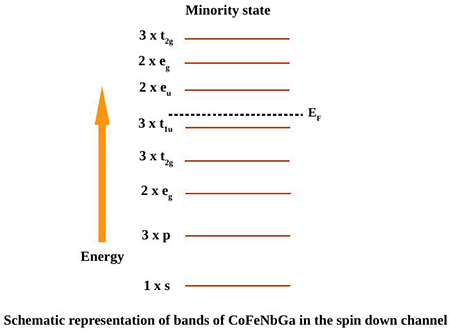 Our results reveal that CoCrNbGa and CoFeNbGa are half-metallic ferrimagnets satisfying the well-known Slater Pauling rule Mt = Zt − 24 from the analysis of electronic and magnetic properties. The half-metallic behaviour of CoCrNbGa and CoFeNbGa are robust against hydrostatic strain for a considerably wide range of lattice constants which makes them potential candidates for spintronic applications. CoMnNbGa is a non-magnetic 24 valence electron semiconductor and has better thermoelectric performance than CoCrNbGa and CoFeNbGa. 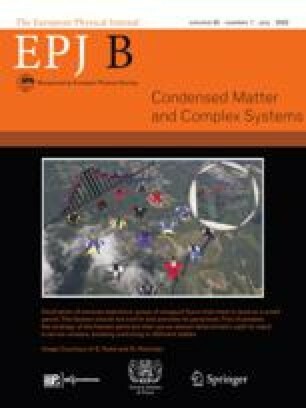 Supplementary material in the form of one pdf file available from the Journal web page at https://doi.org/10.1140/epjb/e2019-90663-3 .